FIFA Chief Rejects Responsibility For Welfare Of Workers In Qatar : The Two-Way Sepp Blatter, who heads soccer's governing body, said the companies that employed the migrant laborers building the infrastructure for Qatar's 2022 World Cup were responsible for their safety. 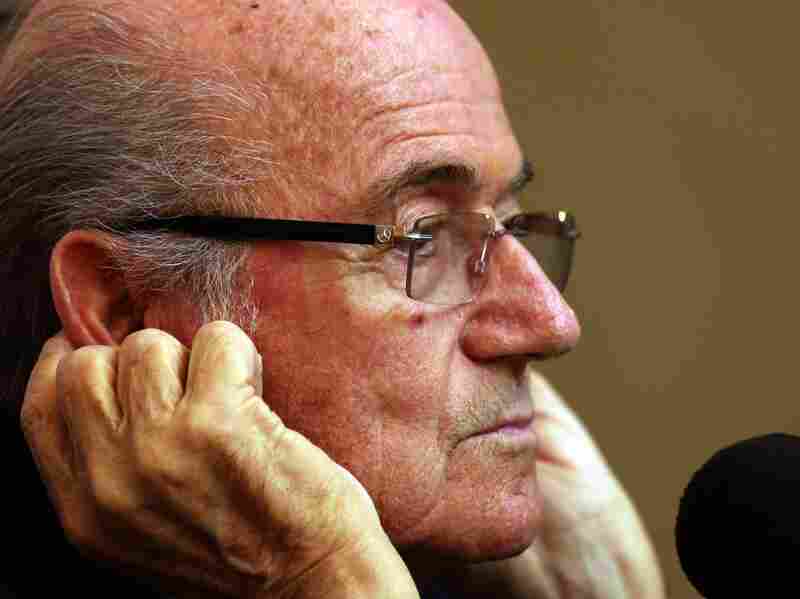 FIFA President Sepp Blatter told a news conference in Colombo, Sri Lanka, on Tuesday that FIFA wasn't responsible for the working conditions of laborers who are building the stadiums for the 2022 World Cup in Qatar. He said the companies that employed the migrant workers should be responsible for their safety. FIFA President Sepp Blatter said today that soccer's governing body is not responsible for the working conditions of laborers who are building the stadiums for the 2022 World Cup in Qatar. "In Qatar they are working in big companies from Germany, from France, from England and from other European countries and they are responsible [for] ... their workers and not FIFA," Blatter said while on visit to Sri Lanka. As we reported last year, several workers have died while building the infrastructure for the World Cup in Qatar. Many of those dead are from Nepal. In an interview on All Things Considered last year, sportswriter Stefan Fatsis noted that "almost 1,000 workers from Nepal, India and Bangladesh alone died in Qatar in 2012 and 2013." One labor rights group estimated at the time that if those conditions persisted, more than 4,000 migrant workers would die ahead of the World Cup. There have also been reports of poor living conditions and of abuse by employers and the Qatari government. Qatar, like other energy-rich countries in the region, relies heavily on migrant labor to fuel its economy. As we noted in a separate story on Qatar's labor force, the country's 1 million foreigners make up more than 90 percent of its workforce. In the face of complaints, Qatar's government said it would take steps to address the criticism, but in a report last month Amnesty International said the country was "severely lagging behind on efforts to address the rampant abuse of migrant workers' rights." Four years ago, FIFA awarded Russia the 2018 and Qatar the 2022 World Cup. The move was criticized almost from the start. There were allegations of corruption, and a FIFA report last month cleared both countries of corruption over their winning bids. Almost immediately, that news was met with derision and soccer's governing body announced Nov. 20 that it will further review the bidding process that gave the two countries the World Cup.